Pocket Trap and Modus Games have announced frenetic non-stop action game Ninjin: Clash of Carrots for Nintendo Switch. Ninjin: Clash of Carrots is a fun beat’em up game playable alone or with another play online or locally. It’ll be out September 4 on the Nintendo eShop for USD14.99. Ninjin: Clash of Carrots, a frenetic, non-stop action game developed by Pocket Trap and published by Modus Games, arrives September 4, 2018 on Nintendo Switch, PlayStation®4, Xbox One and Steam. The game’s humorous storyline can be played in single-player, as well as local or online 2-player co-op. Set on a fantasy continent inspired by the Japanese Feudal era, Ninjin: Clash of Carrots is a hilariously fun beat-’em-up with a heaping dose of customization options to make each stage fresh and exciting. 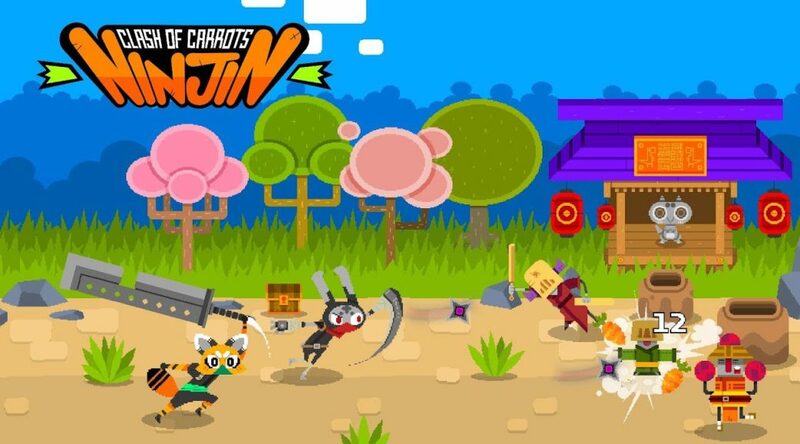 Battle through side-scrolling worlds as Ninjin, a charismatic bunny, or as Akai, a ninja fox, to recover your village’s stolen carrots from the claws of the evil Shogun Moe. Take down numerous enemies and bosses, collecting carrots along the way which can be spent in the Corgi Store to purchase new equipment, or the Shady Shop for special weapons, tons of masks and other customization items. Choose from a wide variety of equipment, outfitting your character to better defeat your opponents. Then get back out there and kick some tail! Ninjin: Clash of Carrots also features a special survival mode called “Oni TV Show” – also playable in both single and multiplayer – where you’ll have to fight endless waves of enemies to rack up rare rewards. Challenge a friend to see who can progress the furthest. Ninjin: Clash of Carrots is easy to pick up and play, but only the most skillful ninjas will master the game! Fast and Furious Combat. Dodge rockets, blast through throngs of incoming enemies and battle bosses in frenzied, fast-paced action! Stylish Visuals. Play through unique environments with anime-inspired HD pixel art graphics. Deep Customization. Choose from a huge variety of equipment with more than 150 weapons and items, including masks, swords, projectiles, and more. Equip your character to better defeat rivals. Oni TV Show. Compete in a “Live TV Show” survival mode, solo or with a friend, to see who can get the furthest without dying, as wave after wave of enemies attack from all angles.Rack up special rewards when you successfully finish each challenging stage!